The property during a better, less eroded time. Since last spring, much of the area marked in red has eroded and neither the HOA nor the developer have taken responsibility. Check out DallasNews.com for an after shot to see how things stand now. So you come home one day to find that the slope at the back of your yard has begun to slough off into the pond behind your property. You call your homeowners association, which is supposed to handle such disasters, but they do nothing because the pond in question still technically belongs to the developers, who also do nothing. Meanwhile, that slope become more and more like a precipice while the two possible responsible parties do everything but take responsibility. Thankfully, that’s not actually happening to you, unless you’re the Frisco, TX, family whose story is told in the Dallas Morning News. The problems began last May, when the family noticed some erosion following a heavy rain. A call to the HOA resulted in no shoring up of the slope, so when rains came again in early December there was more loss of backyard. And right before the new year, the erosion was all the way up to their fence line, quite some distance from the water below. Finally, it comes out that the HOA didn’t do anything because the land for the pond had not yet been deeded over from the developer. 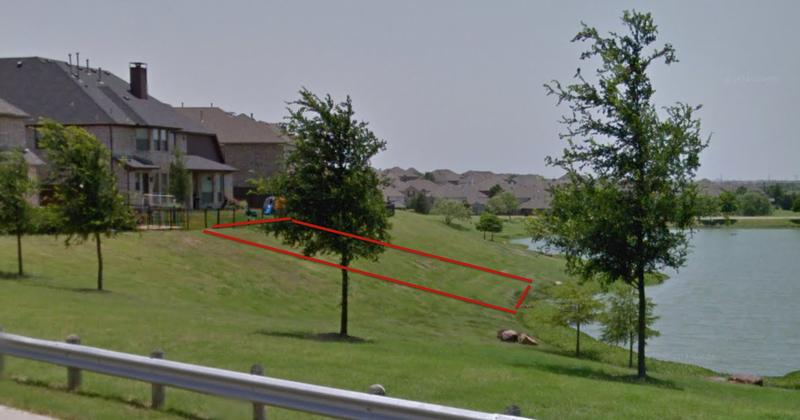 The developer admits that there was an error in the deed for this common area of the subdivision, but that the HOA has been maintaining the land regardless for years. The HOA claims that it tried to get a permit to shore up the eroding slope, but the city would not provide them one because the land still technically belonged to the developer. The city’s deadline for the developer to figure something out has come and gone. Now the city says it hopes to get all the parties together to hash out the problem. Meanwhile, the homeowners check the fence every morning and don’t let their kids play in the backyard anymore without supervision.